Take control of WHEN your articles get published! “Big Dump” Submit all of your articles at one time to be released all at once. – This is the right approach when you begin with EzineArticles.com. “Sprinkle” Submit them over time to be released over time. – If you’re a veteran Expert Author, there can be value in scheduling your articles for release over a period of time to maximize traffic returns. One of the easiest ways to “sprinkle” your articles over time is to use the Scheduled Article Release Feature, which is one of the many benefits of EzineArticles Premium Membership. Who is the ideal member that can really take advantage of the Scheduled Article Release Feature? Wondering if EzineArticles Premium Membership is right for you? Surf http://EzineArticles.com/premium/ to discover if the benefits of our Premium service level are right for you now. This is nothing short of an article marketers dream. This means you can make sure that you always have “content on call” and that is something the competition cannot concieve. I adore this feature of my premium membership. I use it on an almost daily basis. It’s such a convenience. This feature works great for me. Only thing I sometimes wish to have is a scheduling for less than 24 hours in advance (e. g. article submitted Monday at noon, goes live Monday evening at 8). I really enjoy the benefit of being able to schedule articles. This part of the premium membership is extremely valuable! Article Scheduling feature is really great as i can submit my articles anytime and schedule for weekends which is the best time to get your articles approved. Similar sentiments to Lance’s comment. Having content on call is great but also requires committment. Maybe that is where we have an edge over our competitors. I must be the only Aussie (from southern hemisphere) that bothers to comment! Oh, and Happy Mothers Day to all you mums (moms)! Anytime one of my articles is published at EzineArticles it is a good thing. To be able to schedule them by plan would indeed be a great help in optimizing some of the articles. Darn ! 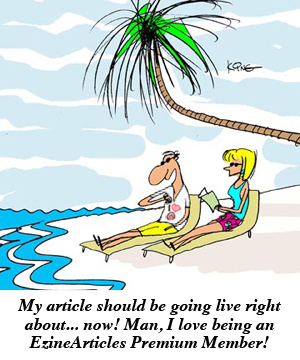 what time did they say, that the message in a bottle from “Ezine-Articles” would get here? Always so happy when you make our, us writers/authors lives easier… this is a great way for us to plan ahead. Thank you for sharing. It very useful information for Ezine-writer. My website-lifesbox.com-has got minimal percent of new visitor sine article published and I will go on with EzineArticles.